Due to its ultra-thin profile, Apple's new MacBook Air was designed with an integrated 37-watt-hour lithium-polymer battery that is not user-replaceable. Though this has caused some initial concern amongst potential adopters, AppleInsider has learned that the replacement process is quite trivial. According to people familiar with the new-generation notebook, there are no special tools or knowledge required to swap out the MacBook Air's battery, which Apple has billed its "thinnest ever" in a product. Instead, the process requires a single size-0 type phillips screwdriver and some diligence. Once flipped upside down, the MacBook Air's bottom cover is easily unscrewed and removed, providing immediate access to the battery cavity. From there, the battery can be unscrewed from the chassis with the same screwdriver and unplugged from the circuit board with a simple tug —it's not soldered to the board. The entire process, according to those in the known, can be completed by any service technician in as little as three minutes. For its part, Apple has announced its intent to offer a MacBook Air Out-of-Warranty Battery Replacement Program, which promises authorized replacements for US $129. The mail-in repair process normally takes 5 business days, the company says. Given the simplicity of the upgrade, however, it's possible that Apple will in time offer the service on-demand at its retail stores. Similarly, third parties could also offer in-home do-it-yourself kits should they be able to acquire battery cells that meet Apple's standard for the MacBook Air. 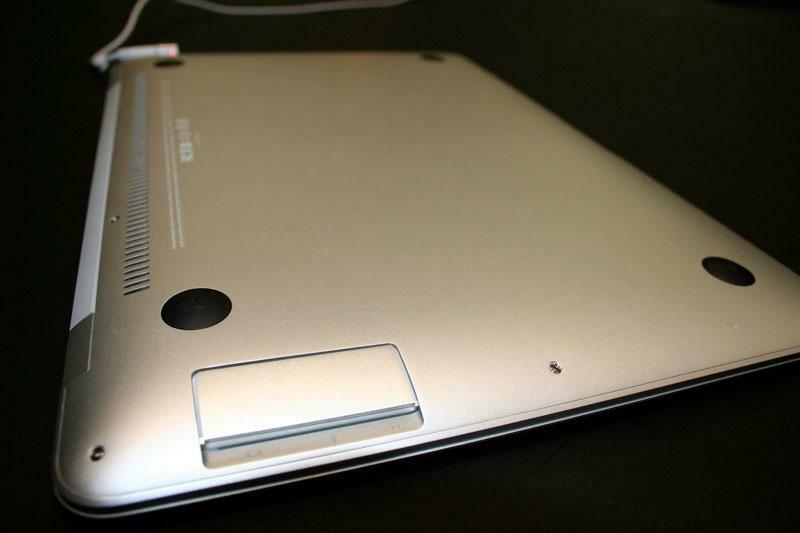 More high-quality photos (1, 2) of the new MacBook Air. There's no word, however, whether the latter process would void the notebook's warranty in Apple's eyes. In the meantime, the company recommends MacBook Air users follow these instructions for optimizing life span and battery life.